The Tigers tied the series 1-1 tonight by defeating the Cardinals 3-1 behind another brilliant performance by Kenny Rogers. On a cold (40 degrees), windy and rainy night at Comerica Park, Rogers held the Cardinals to two hits and no runs through 8 innings. Rogers has now pitched 23 consecutive shutout innings which is the third highest streak in post-season history behind Christy Mathewson (27 innings in 1905) and Lew Burdette (24 innings in 1957). Rogers continued to pitch like a man possessed showing emotion not seen during the regular season. He was yelling at himself the whole game and pumping his fist or otherwise emoting on almost every out. Todd Jones came in to pitch the ninth and, not surprisingly, made the game very interesting. After retiring the first two batters (including Albert Pujols on an adventurous grounder to Inge), Jones allowed a single to Scott Rolen. He then booted a grounder by Encarnacion which would have been the last out of the game. Fans watched in horror as Jim Edmonds followed with a double to make it 3-1 and to put runners on second and third. Jones then loaded the bases when he hit Preston Wilson with the pitch. National League championship hero Yadier Molina came to the plate with a chance to do some serious damage but grounded to Santiago who flipped to second for the game ending out. That was way too close for comfort and I don't think fans would ever have forgiven Jones had he ruined Rogers' historic performance. 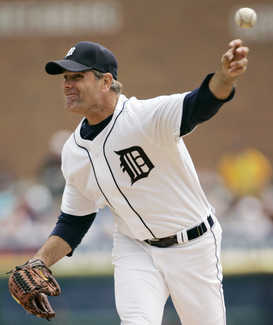 And many would not have forgiven Jim Leyland for removing Rogers with a two hitter. Craig Monroe got the Tigers on the board in the first inning with his second homer in two days and fifth of the post-season. Monroe, who has produced heroics all season long, continues to get big hits in the post-season after being almost non-existent in September. Others get more attention but Carlos Guillen continued his amazing post-season with a triple, double, single and a walk. He is now batting .432/.463/.703 in 10 games. What a great hitter he has been this year. Ivan Rodriguez continues to struggle miserably at the plate in the post-season. He is 0 for 19 in his last 5 games and 5 for 37 overall. After batting .471 in 8 games versus the Yankees and Athletics, Placido Polanco has been cooled off by the Cardinals who have been pounding him inside the whole series.